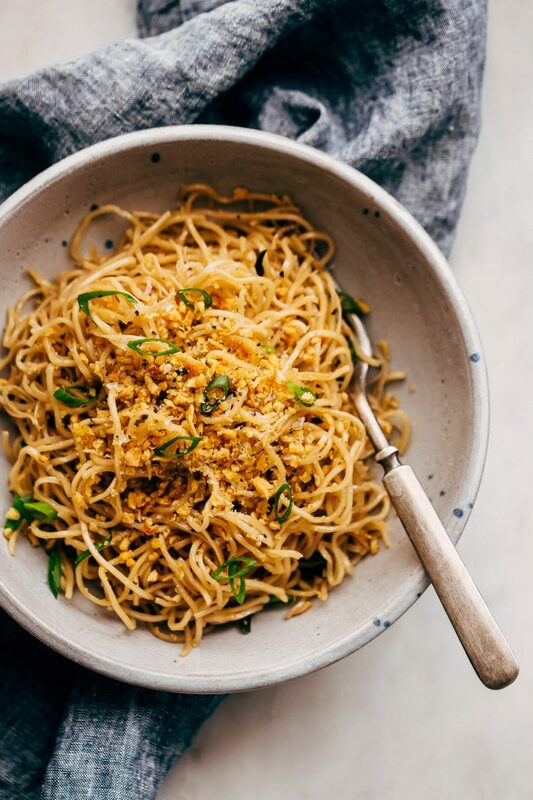 The recipe that I’ve been dying to make us from the moment I got back from Hawaii — quick garlic noodles! No joke, I’m probably the only person on the planet that goes equipped with a small notebook and a pencil to scribble down all the flavors I taste when we dine out. Between that and the number of times I close my eyes to let my taste buds relish things more clearly, I’m pretty sure we manage to get more than a few curious looks. Anees, on the other hand, isn’t even bothered. He’s happily munching away, wholly accustomed to our now ‘normal’ dining out lifestyle. Okay. I know, I know. The internet is full of garlic noodles. But believe me, this one is different — it has a couple of unusual ingredients. Not usual like I’m sending you on a wild goose chase for ingredients you’ve never heard of. Unusual in the sense that you don’t see them too often in a pan-fried garlic noodles recipe. But you know what, I’ll never make garlic noodles without them now. 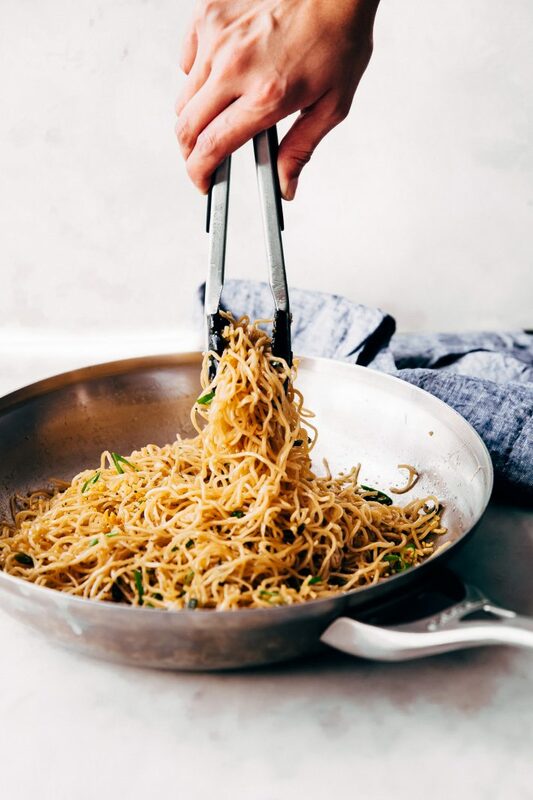 Not that I needed any more reassurances but when I walk into the kitchen to find hubby cleaning the tongs with his mouth as he goes slightly wide-eyed from being caught in the act; I’m pretty sure I’ve made the garlickiest garlic noodles. I didn’t just tell you that. 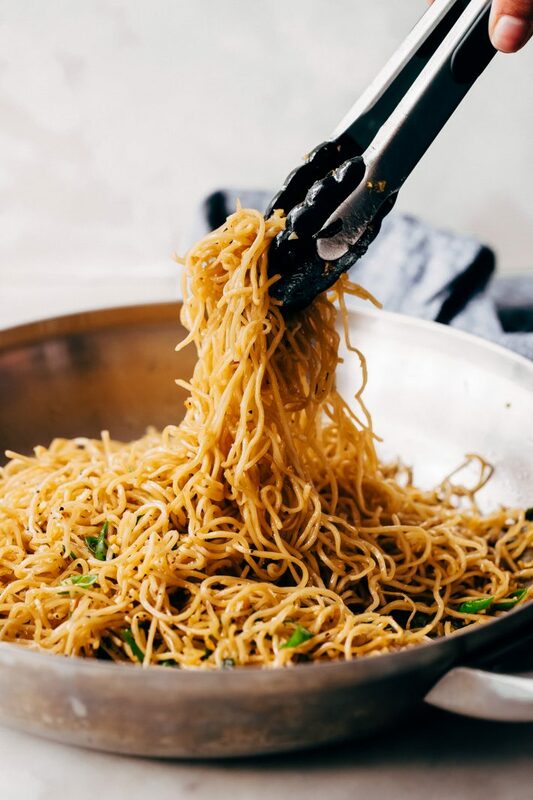 Honestly, when I had my first bite of these noodles in Maui , I thought I’d spend a good year dissecting this recipe from my then frantically scribbled notes and what I could recall from memory. But with more than one garlic lover in this family, I knew I had to get on it fast. And I love how some of you seem to love garlic as much as we do. 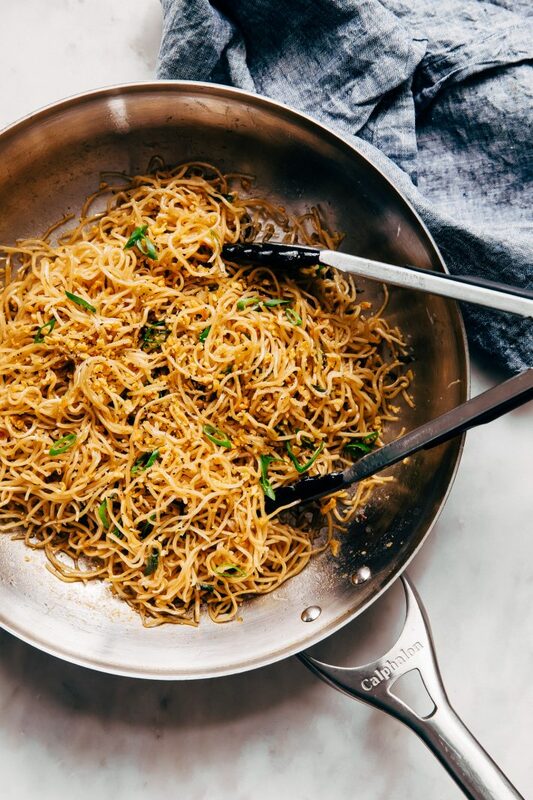 What makes this quick garlic noodles super dangerous is that they’re easy to make. They take in the ballpark of 15 minutes, and it’s almost a bad thing at this point, but it uses mostly pantry or refrigerator staples. The ingredient list on my quick garlic noodles is short. Ten simple ingredients, one of which is optional and that’s the little niblets of fried garlic that you see on top there. It can be a tricky ingredient to find in a regular grocery store, so you can certainly omit it from the recipe or make your own! Just a quick google search will help you with that. Keep in mind; if you’ve got easy access to an Asian supermarket, you can find this easily! Just know that a lot of the brands fry their garlic in palm oil. If you also feel strongly about avoiding palm oil, I suggest checking the ingredient list before you buy. I was lucky enough to find a brand that didn’t, locally. But here’s  (affiliate link) a brand that fries them in soybean oil in case you’re interested. For the noodles I used Chuka soba noodles  (affiliate link) that my local grocery store carries. You can use just about any kind you like! 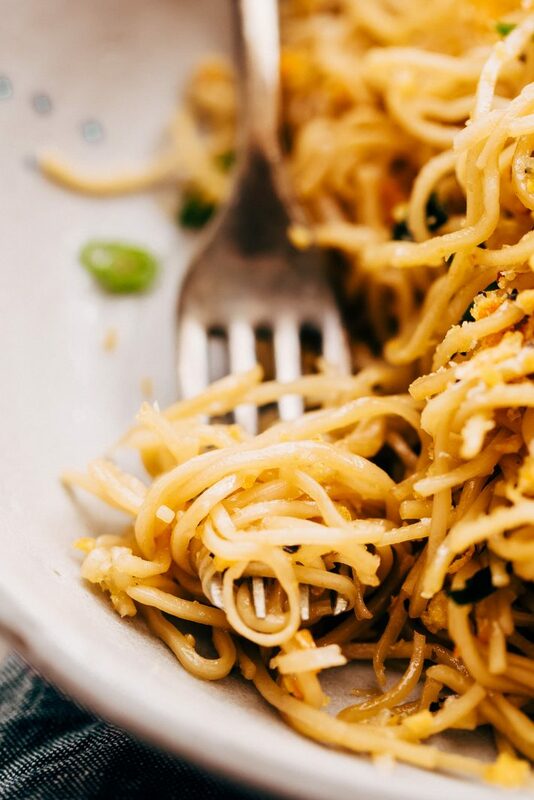 Egg noodles, Hong Kong style noodles, even spaghetti or angel hair pasta will do. This is a fusion recipe; there’s no wrong answer here! The key to making good garlic noodles is to make sure you do the first step right. Which is allowing the minced garlic and scallions to really infuse all of their flavors into the olive oil and butter. This will take you about 5-7 minutes but TRUST. Once you get that part done, it’s smooth sailing. Let your noodles boil while the garlic is doing its thing and make the sauce. I want to also just mention that yes, the recipe reads fish sauce AND parmesan cheese together and I know you’re about to hit the ‘x’ at the top of this window, but I wouldn’t do you wrong. It’s not weird when the garlic has a chance to get in there and work its magic. It’s seriously a flavor bomb from all the umami that this recipe is loaded with. They take about 15 minutes, give or take. You’ve probably got almost all the ingredients in your pantry or refrigerator. You can serve this with just about anything! 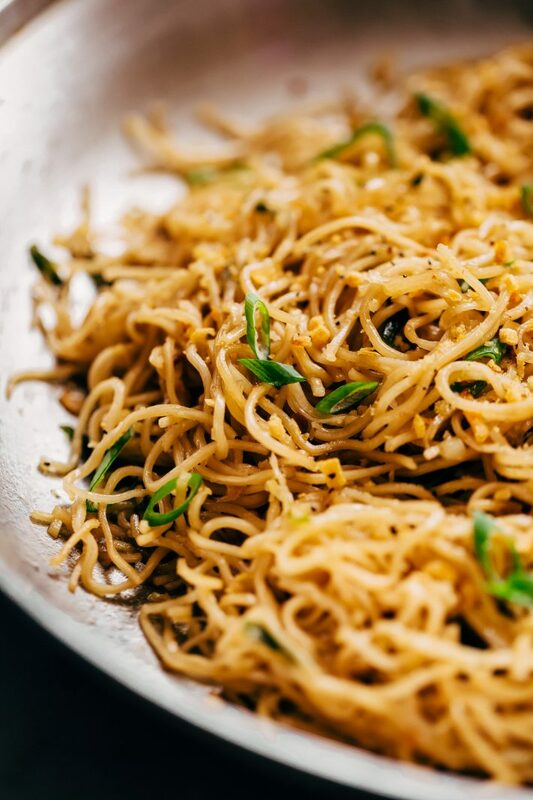 Hubby made a spicy Thai chicken last week, and we swapped the quinoa for these garlic noodles. But really, we’ve had this with miso salmon too, and you just can’t go wrong here. You can grill or stir-fry chicken and toss it in here at the end too, and then you’ve got garlic noodles with chicken (so doing that). Perfect for when you’re a single lady (or dude) like I am on some weeknights, and all you want it a bowl of comfort food and you want it FAST. Quick garlic noodles serve four but if you ask my husband, he’ll tell you there’s just enough for one. Honestly though, plan on making more than you think you’ll need. It’s so dang hard to stop yourself from eating the whole pan! Infuse the Butter: Heat a large pot with water and allow it to come to boil, cook the noodles according to package directions, drain and set aside. While the water is boiling, grab a large, non-stick skillet and place it on medium-low heat. Add the butter, oil olive, garlic, and scallions. Let the butter infuse with the garlic for 5-7 minutes, stirring often. The garlic should barely sizzle here, you don’t want it to brown. 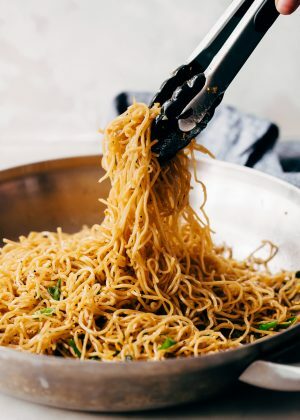 Garlic Noodles: While the garlic is going, grab a small bowl and mix together the fish sauce, oyster sauce, and the sugar. When the garlic is cooked, kick the heat up to medium-high, stir in the prepared sauce; let cook for 30 seconds. Add the prepared noodles and toss with parmesan cheese (yes, parm!) Let the noodles cook for a minute so they soak up all that flavor. 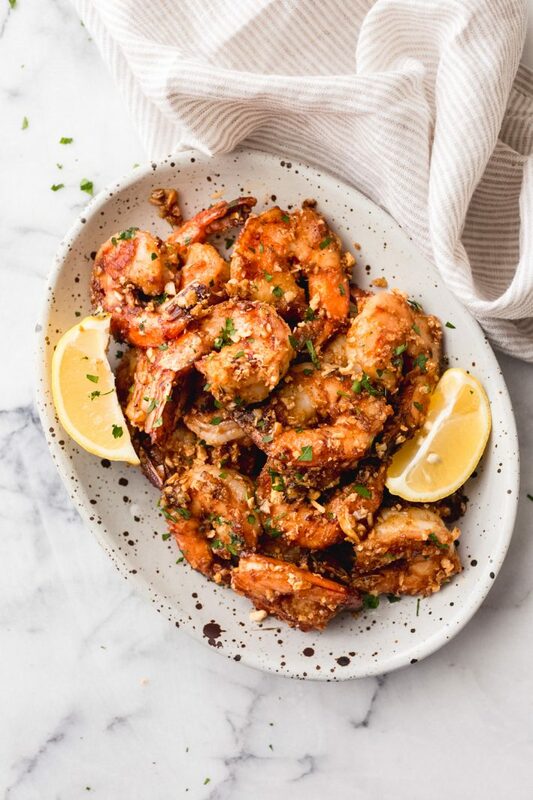 Top with fried garlic and serve immediately! That flavor is like NOTHING you’ll ever have. Please note: after a few responses from readers, I’ve adjusted the amount of fish sauce + oyster sauce to read ‘1-2 tablespoons.’ I use 2 of each and didn’t find it had a fishy flavor but a few people mentioned that it was a bit pungent for their taste. I suggest starting with 1 tablespoon of each and adjusting as desired! You can use a lot of different kinds of noodles here. I used Chuka soba noodles  (affiliate link), but egg noodles, Hong Kong noodles, spaghetti, or even angel hair pasta will work here. You can serve this with just about anything you like! This recipe can easily be doubled if you want leftovers, and really with all that garlic, who wouldn’t?